Training in skills-based health/SEL education. Aligning assessment, curriculum, instruction, and SEL competencies to state and national standards. Learning how to use assessment to improve teaching and learning. Designing and using authentic assessments. Desinging and implementing analytical rubrics. Using formative and summative assessments. Designing and Implementing professional development programs. Teaching onsite and online graduate courses through Cambridge College. Building and implementing a Whole School, Whole Community, Whole Child program. Assessing health curriculum using HECAT. Assessing physical education curriculum using PECAT. Organize a state and national standards-based wellness program. Want to learn how to teach skills-based health education? This text provides a step-by-step approach to teachng skills and SEL for each grade span. Each skills chapter includes a complete unit and all worksheets. Classroom Skills Practice worksheets are designed for the in-service health educator. If you are interested in an initial license and a Master's Degree, contact Mary for more information about the Cambridge College Skills-Based Health/Social Emotional Learning program. All courses are based on the AAHE/NCATE and Massachusetts standards for teacher preparation programs. Our graduates are prepared to teach comprehensive skills-based health/SEL education and assume leadership roles in their district. The Cambridge College Skills-Based Health/Social Emotional Learning program also offers two online 12 credit certificates. One for health/SEL education and one for physical/SEL education. Please contact Mary to make arrangements. Formative assessments enhance teaching and learning. These 17 formative assessment tools are appropriate for K-12 or teacher education programs. This is a step-by-step five lesson skills based backwards design unit based on Standard 7, practicing healthy behaviors. The 28 page unit contains, objectives, standards, assessments, and instruction as well as the performance task (prompt, rubric, and handouts). From the unit, five detailed lesson plans provide specific directions on how to teach skills-based pedagogy from bell-to-bell. The first two lessons contain assessment and instruction on Safety Tips, Rules of the Road, Properly fitting a bicycle helmet, and using hand signals. In the third lesson, students receive a performance task, that includes a prompt, rubric, and handouts. During lessons three and four, students work coopertively to practice demonstrating proficiency in content and skill. During lesson five, students present their poster and role play. Students are summatively assessed with an analytical rubric based on the infused performance indicators of the National Health Education Standards. This is an excellent tool to teach skills-based health education. The directions for each lesson are thorough and contain everything you need to teach the class. Enjoy! This backwards designed lesson plan is based on the National Health Education standards and is aligned with Social Emotional Learning. It is lesson 1 in a series and begins with the structure of an e-cigarette, health consequences of use, and refusal skills. Materials include a completed lesson plan, clouds to label an e-cigarette, background information about E-cigarettes from KidsHealth, refusal skills, true/false review, and an exit ticket. Many districts are reorganizing their structure and calling health and physical education, a wellness program. If your staff is teaching in a different discipline, different knowledge, skills, and pedagogy apply. To ensure the success of your wellness program, train your staff to deliver the curriculum in the new instructional setting. The best way to get started is to contact me. We can discuss your needs and design a program that will uniquely suit your district. "I wish I learned how to design skills-based health education lessons as an undergraduate!" "Now that I understand how important a Whole School, Whole Community, Whole Child program can be to improve health and academic performance, I plan to start one in my school"
If you have questions about how my services can improve your programs, please contact me. Good health is essential for effective learning. Schools help students overcome barriers to learning and increase academic achievement by coordinating the resources already present in their schools and community. provides for healthy, safe, engaged, supported, and challenged youth by coordinating policy, process & practice resulting in improving learning and health. The community provides wrap around support for the components, the school, and the students. 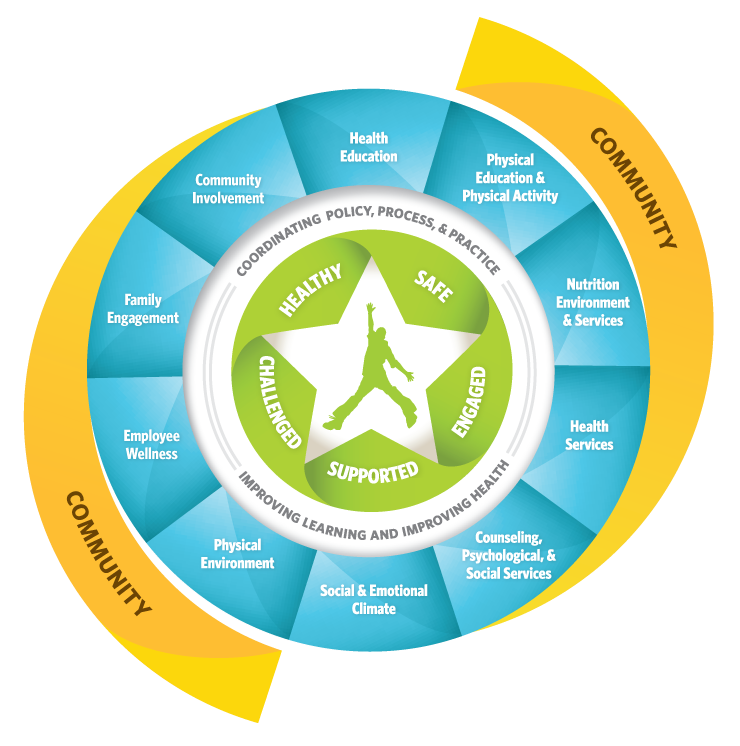 Ten interactive components play an important role in the health of students, staff, and the community.